Originally published in the WHO Goodwill Ambassador’s Newsletter for the Elimination of Leprosy, Issue No. 56 (June 2012). The information was correct and current at the time of publication. Teacher, poet and activist Nguyen Duc Thin has a love of life that leprosy couldn’t dim. Nguyen Duc Thin says his autobiography runs to 400 pages. That may still not be enough to encompass his seven decades of experiences. Born in Vietnam’s Bac Ninh Province in 1940, Thin grew up to teach history and literature to elementary and middle-school students. While still a boy he was part of a teenage guerilla unit collecting information on the French colonial occupiers. In 1963, as an up-and-coming teacher, he launched the “thousand good things movement” at his school, which spread nationwide, to encourage pupils to do good deeds at school and at home. Diagnosed with leprosy at the age of 39, he was sent for treatment at Quynh Lap Hospital of Dermatology and Venereology in Nghe An Province. He spent four years there, from January 1979 to January 1983. As he put it in one of the many poems he has written, life did not come to an end in Quynh Lap; Quynh Lap was “a comma to the next page” of life. Soon after arriving, he met some girls from the nearby village who teased him about his disease. “Yes, I have leprosy,” he told them, “but I will be cured.” “Stigma,” he continued, “is leprosy of the mind and soul.” Talking with Thin and listening to his poetry changed the girls’ outlook. They started visiting the hospital, became good friends with him and participated in hospital activities. Thin took his positive message about leprosy to the surrounding community. He convinced local residents with his explanations and his self-confident manner that they had nothing to fear from the disease. Within Quynh Lap, he encouraged his fellow inmates to adhere to their treatment and learn everything they could. Finding there was no school at the hospital, he helped to start one for the children of patients. He taught them poetry and took them on excursions to show them what life was like outside the confines of the hospital compound. After being discharged, Thin resumed his teaching career at his old school. He was admired and respected for the way he never let the disease get him down. Although I contracted leprosy, I still loved life and kept my faith in human beings. 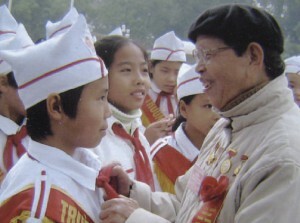 Thin’s achievements are reflected in the recognition he has received from the Vietnamese government: he was designated a Hero of Labor in 1985 and Teacher of the Nation in 1988. He has also been active in diverse organizations including the Red Cross Society, the Study Encouragement Association, the Vietnamese Association of Writers and Artists and the Vietnamese Fatherland Front. Poetry is especially important to him. “It makes me enthusiastic, romantic, eager for life and strong,” he says. He identifies with the famous Vietnamese poet Han Mac Tu, who contracted leprosy at the age of 37 and died in 1940. Now 72, he is retired from teaching and serves as a special tour guide at Do Temple, a famous temple in his home village of Dinh Bang. He writes poetry, using a pen to tap out the words on a keyboard with clawed hands that are a legacy of his disease. And he continues to speak out about leprosy.